Create a beach-inspired youth bedroom with Mivara Collection by Ashley Furniture. Let your kids feel the sea atmosphere no matter where you live: smell of the salt water, warm sun and crashing waves. With a little decorations and some creativity you can turn your home into a beach-like retreat. Blue and white colors of the Mivara offer a standard scheme for any nautical-inspired bedroom. Plus, a soft light blue finish and contemporary design flawlessly captures the innocence of youth. Give your child the opportunity to change the look of the bedroom with three interchangeable drawer front designs (trellis, mirror, light blue) and to choose from three different bed styles: Panel Bed, Panel Bed with Trundle and Upholstered Sleigh Bed. Use nautical bedding and accessories, seashells, starfish and sand in decorative vases to further enhance a beech-like feel. Bring whatever you feel from the beach to add a fresh, beach-house inspired look to any space. For other smart design and decorating ideas, or to browse the hottest Top 10 Sets and accessories, visit FurniturePick. Enjoy the beauty of Vintage Casual design of Juararo Master Bedroom Collection by Ashley Furniture at FurniturePick. The design comes to life with the aged brown rough sawn finish flowing over a replicated oak grain along with the case pilaster detailing and warm pewter color hardware making the Juararo Bedroom Collection the perfect way to create that cottage getaway within the comfort of your home. Don’t forget to compliment your bedroom with vanities, jewelry armoires, bedding sets or other accessories such as lamps. To get more bedroom inspiration, check Top 10 bedrooms or browse our online gallery at FurniturePick. If you have purchased any Ashley Furniture from FurniturePick, consider leaving a review and let others know more about your experience. We Appreciate Your Feedback! The Prentice Bedroom Collection by Ashley Furniture with a light airy finish along with a relaxed contemporary design and satin nickel color hardware that complements the bright finish. This collection is sure to awaken the decor of any bedroom. The Bostwick Shoals Bedroom Collection with a relaxed cottage design and beautiful frame details along with scalloped tops and base mouldings, all bathed in a glowing white finish. The Alyn Youth Bedroom Collection takes a clean white contemporary design with curved case fronts and sleek burnished metallic color hardware and creates a magical collection with function and design options perfect for any decor. To get more bedroom inspiration, check Top 10 bedrooms or browse our online gallery at FurniturePick. The Shoney Bedroom Collection by Ashley Furniture offers the perfect chance to express your unique personality and style. 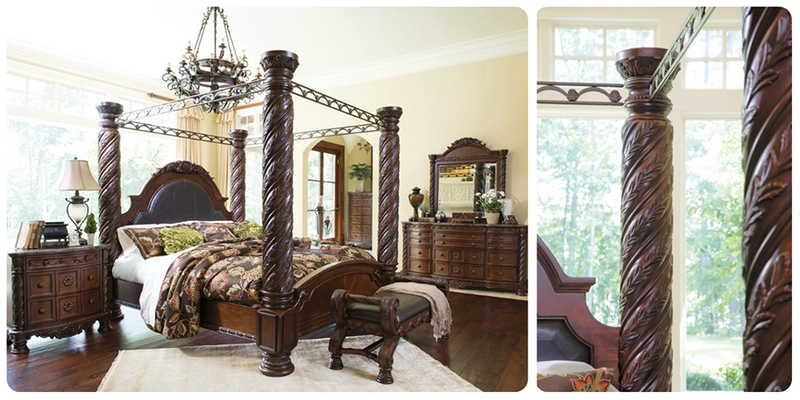 With the rich black finish beautifully accented by the ornate scrolling inserts and antique gold color finished hardware, the sophisticated traditional style of Shoney perfectly transforms any bedroom decor with a warm inviting traditional atmosphere. Not quite the color or style you need? Choose from our Top 10 Bedroom Set or browse our huge selection by defining your own criteria at FurniturePick’s secure website.